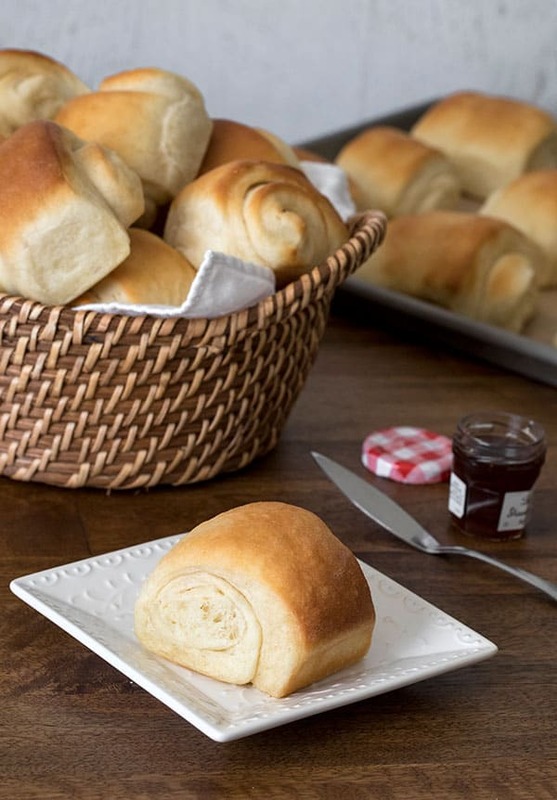 Lion House Rolls are a popular dinner roll for a reason. They’re big, fluffy, easy-to-make, old-fashioned dinner rolls that your family will ask you to make again and again. 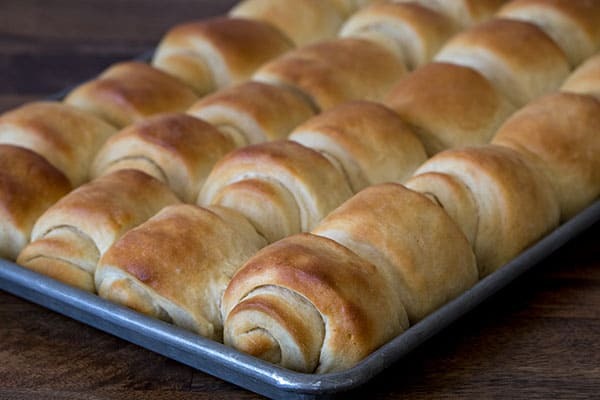 One of the great things about this Lion House Rolls Recipe is it makes 2 dozen rolls. 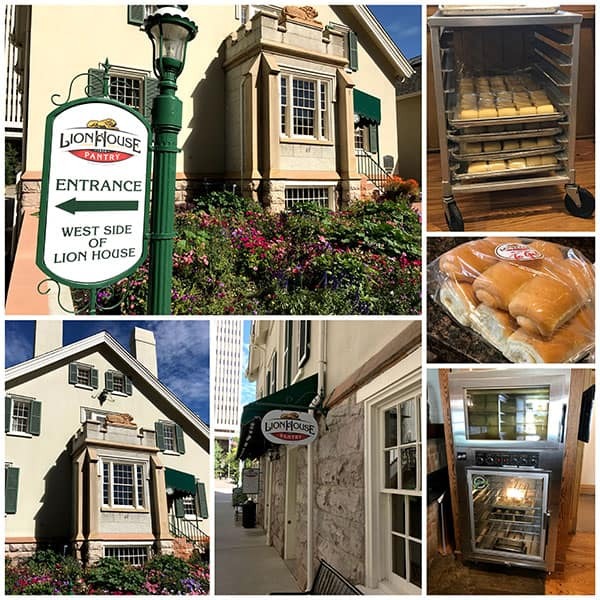 It’s known for it’s home-style cooking, but especially for The Lion House Rolls. If you stop in for lunch, they’ll have yeast rolls rising and baking. The smell of rolls baking is what keeps people coming back for more, I’m sure. This simplifies and speeds up the process because you can use warmer water and today’s great quick rising yeasts. I used Red Star Platinum Yeast, but you could also use Red Star Quick Rise Yeast. If you prefer to use Active Dry Yeast, you’ll need to increase the rise times. Lion House Rolls, in addition to being big and fluffy, are super buttery. There’s butter in the dough, and then more butter is spread on the dough before shaping the rolls. Next, you’ll cut the square into fourths. Then cut each fourth into 3 rectangles. 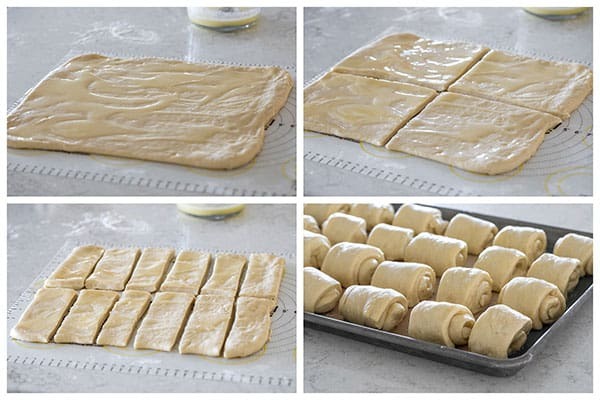 Roll each rectangle up like a snail and place the rolls on a baking sheet with the roll resting on it’s open edge. I had a friend over to help me make the Lion House rolls recipe. We had a great time in the kitchen together, and we made four dozen rolls in less than two hours. Kids would have fun rolling these rolls as well. Put Lion House Rolls on your Thanksgiving menu this year. You’ll be so glad you did! 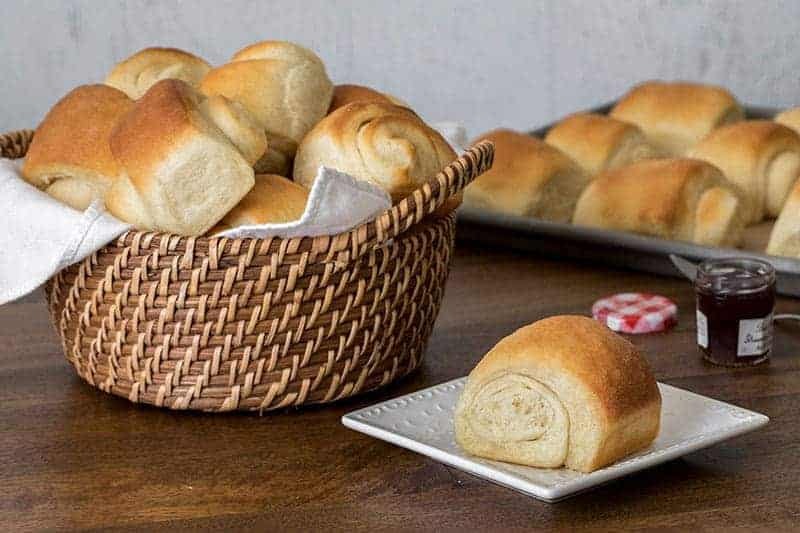 Lion House Rolls are big, fluffy, easy-to-make, old-fashioned dinner rolls that your family will love. Add water to flour mixture. Mix at low speed until moistened. Beat 2 minutes at medium speed. Add 1 cup flour and mix at low speed until moistened. Beat 2 minutes at medium speed. Add 1/3 cup softened butter and egg and beat 2 minutes more. Roll each rectangle up like a snail shell, and place on a silpat or parchment lined or lightly greased baking sheet with the roll resting on the open edge. Repeat with the second half of the dough. Uncover the rolls and bake until they are browned and cooked through, 15-20 minutes. Brush with additional softened or melted butter while they are still hot. Do you find AP or bread flour works best? I have both so I’m just curious. Thanks! Hi Julie – I prefer using bread flour when making rolls. Enjoy! I’ve been baking bread for 35+ years and these are the best rolls I’ve ever made or eaten. After the Thanksgiving meal, our youngest hid some so that her dad wouldn’t eat any as a snack, and then took the rest home. Nothing beats a perfect homemade roll fresh out of the oven! These look amazing! Those are the prettiest, prettiest rolls. I would love for these to be at my Thanksgiving table! I’ve never heard of Lion House Rolls before, but it quite looks yummy and amazing. I think I have to try it once, and instead of buying making rolls at home is very healthy and it takes less cost. I’ve never heard of Lion House Rolls before but they look so pillowy and delicious. I can’t wait to try them! I am such a sucker for homemade rolls. These are absolute perfection. Is there any part of this recipe that can be done the night before or must it all be done on Thanksgiving Morning? Hi Joan – I generally make rolls several days or even a week before Thanksgiving. I bake them until they’re until they’re almost completely bake, but just light brown. Then I’ll cool, freeze them in Ziploc bags. On Thanksgiving morning, take the rolls out of the freezer and leave them on the counter to thaw. When everything else for dinner is finished I’ll put the rolls in a preheat 350 degree oven and bake them a few minutes until they’re golden brown, hot and ready to serve. If you wanted to do them the night before, you could skip the freezing part. Enjoy! These look so amazing! I would love them with dinner or as breakfast with jam. Those are look so perfect – love that buttery golden finish! I need to try this for Thanksgiving. Oh happy days, look at those beauties! I have some Lion House cookbooks here and have seen this recipe but never have tried them. They sure do look delicious. What fun having a friend over to bake-sounds like you had quite the production line going-that’s a lot of rolls in a couple hours! I bet your whole house smelled heavenly while they were baking. I always make rolls for Thanksgiving dinner too-with all that buttery goodness inside, this recipe may be the one I try this year. 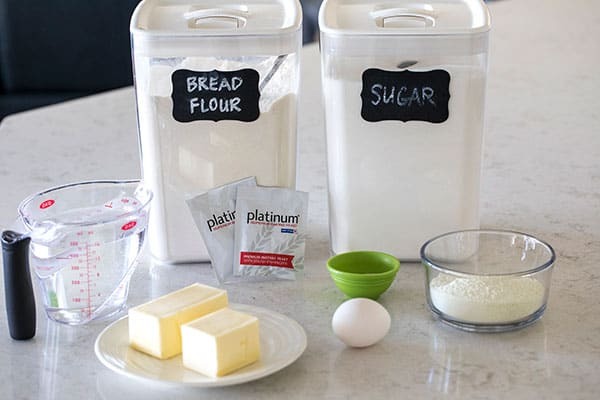 About what size is your baking sheet that you used for them? . Thanks Carol! You definitely need to give them a try. It’s a standard half size baking sheet 13 x 18. Enjoy!